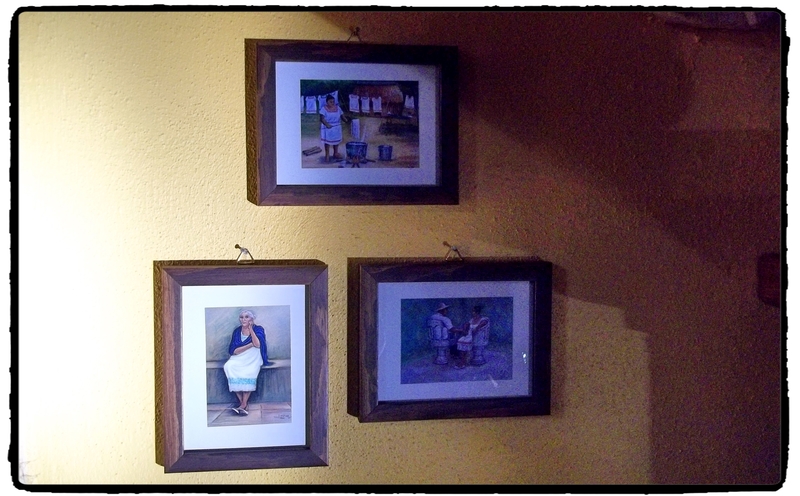 WALKING PAST the living room this morning, I noticed how sunshine through the big windows fell on these little framed prints that we purchased last January in Mérida. They were about the only souvenirs we brought back from the Yucatán, not being big souvenir people. And they were not purchased so much as souvenirs as they were purchased because I liked the three little prints. One is an old woman just sitting. Another is a woman washing clothes in a big pot over a fire. The third is an old couple sitting on a concrete love seat. We spotted those concrete love seats in many parts of Mérida, in parks and plazas. I have never seen them anywhere else. One evening we were walking the nice, dark streets near the Casa Alvarez, the downtown guesthouse where we stayed in a penthouse room, very nice place to stay if you’re ever in Mérida, by the way, and we happened upon a bunch of shops and restaurants abutting a plaza. That was where I found these three prints, which I bought immediately. They were cards really. Perhaps there was a place for an address and stamp on the back. I don’t recall. But if you put most anything in a frame, it rises to any occasion with a new-found elegance. They are hanging now next to the stone fireplace in the living room. It was my first — and last — extended stay in Mérida, but it was not my real first. That happened back around 1975 when I was working on the San Juan Star in Puerto Rico. The newspaper’s union, run by a pack of pinche communists, went on strike, and it looked to be a lengthy one. The devil, I said to myself, so I packed my bags and got on a plane to Haiti. After a few days in Haiti, I got on another plane to Mexico City. That flight first landed in Mérida, and everybody on the plane was hustled off to get shots against any Haitian cooties we might be carrying into Mexico. I never got out of the Mérida airport that day, but it did count as a visit to the Yucatán, I think. Mérida is an okay place, a nice Colonial city that looks pretty much like all Colonial cities in Mexico, something I wrote about shortly after returning home from that trip. It’s quite touristy and very popular among Gringos who are smart enough to move across the Rio Bravo. I could never live there due to the climate. I have sweated enough in my life. And there are no mountains. Living without mountains is like eating a pizza without anchovies. It’s no pizza, a sham, a joke. It’s midday now, and the three framed pieces have moved into the near-constant, cool dimness of the living room where they will not be very noticeable until tomorrow morning, assuming it’s not overcast. Amazing how three postcards can inspire this many words. I loved Merida! Tidy, pastel houses like petits fours. The elegance of Paseo Montejo. A well-mannered populace. Bookstores and a feeling around the plaza that reminded me of someplace far beyond Mexico. A well-decorated mall with an ice rink. But there were 2 deal-killers: the interminable flat landscape that made Iowa look like the Colorado Rockies and the unforgiving, relentless heat, even in December. I’d go there again, but only to visit. And only during the coldest time of year. Ms. Shoes: My reaction was a bit less enthusiastic than yours. I will not be returning. There were nice elements. The Paseo Montejo reminded me a bit of Havana, a better-off version, of course. Missed the ice rink, but no matter. As for the populace being well-mannered, I don’t think that applies to some of the tourist stores downtown where I got the impression I was back in New Orleans or Puerto Vallarta being badgered by storefront hawkers. But, as you note, there are two elephants in the room: the climate and the boring terrain. We went in January. Not an accident. And the weather was quite acceptable. I love this post and the included links, three great stories for the price of one. Thanks, Peter. Customers always get their money’s worth here. Never been there, and not sure if it’s real high on my places to see list. Many other places to visit in this great land first. Tancho: There are indeed other and better things to do here with your time and money. I have enjoyed each of my Mérida trips. The archaeology would be enough to attract me for a longer stay. But then there is the heat and humidity. I didn’t think there was anyplace in Mexico hotter and wetter than Melaque. I was wrong. Steve: The pyramids are interesting enough. As I noted on the first Mérida yarn back in January, what we see are, to a large degree, replicas. Photos taken in the early part of the 20th century clearly show how destroyed by time those sites were. That takes a lot of the interest out of it for me. Color me slow. Loulou: I agree, which is to say we are of one mind. Tru dat about the climate. Need to visit in January/February. They have lovely string hamacas, one of which hangs on the screen porch at our cottage in Canada! Carole: We had originally scheduled the trip — had the guesthouse reservation paid and all — for March of last year, but my wife came down with a really bad cold two days before we were to depart, so we rescheduled for January. I had initially made the reservation in March due to thinking that summertime would be the hottest. However, I learned later that spring is actually the hottest time, so we dodged that bullet. I loathe heat. The giant asteroid that hit the Yucatán Peninsula sixty-five million years ago may have had some impact on the geography of the region. My most memorable experience in Mérida was watching an American tourist get out of a taxi and freaking out to discover she had left her iPhone in the back seat after the cab took off down the block. Andrés: So did the tourist catch the cab or not? Alas, it was too late. The driver must have appreciated the nice tip. Mérida is lovely, but I agree with you on the climate and flatness. Here in Zacatecas, the climate is literally a breath of fresh air. After spending some time looking at real estate ads (which shows that houses aren’t that expensive) it surprises me that there do not appear to be any gringos living here. Of course they’d probably have to learn Spanish, which may be the barrier. Of course your area isn’t exactly awash in English-speakers either. Where we just tried a fantastic, new dish, “Asado de Boda,” a local tradition. Kim: Zacatecas is overlooked by Gringo expats. I’m not sure why. One reason, I have heard often, is the temperature extremes, even though you say the stats show otherwise. I’m not sure where reality lies. The not-so-distant town of Jerez seems to attract those few who are drawn to that area. Zacatacas was surprisingly small to me, but I liked it a lot. As for my area being awash in English-speakers, more and more are, disturbingly, coming every day, to my horror. While I have nothing against Gringos as such, but they do bring changes where they gather and settle, and many are not nice changes.